At the end of the Arrow-verse Elseworlds crossover event in December (which ran across The Flash, Arrow, and Supergirl), The CW indicated that the Fall 2019 crossover will be the Crisis on Infinite Earths. For those not familiar with that, it was one of the first comic book “event series” (coming out in 1985) and it was used to simplify the rather convoluted cosmology of the DC Universe which spanned multiple “Earths” at that time. The Arrow-verse shows have established that they have multiple universes of their own (Supergirl takes place on a different Earth than the one seen in Arrow, The Flash, and Legends of Tomorrow). So with those shows now getting their own Crisis on Infinite Earths, this may be an opportunity to consolidate universes and also trim down the number of Arrow-verse entries. Since the debut of Arrow back in 2012, The CW’s superhero entries have been among the most popular shows on that network, and their number has grown from one to five (including Black Lightning which is not officially part of the Arrow-verse but could be merged in). But the ratings have been on the downswing the past few seasons and the network could see the event series as the perfect opportunity to trim the ranks. So which shows would go if The CW decides to make a purge? 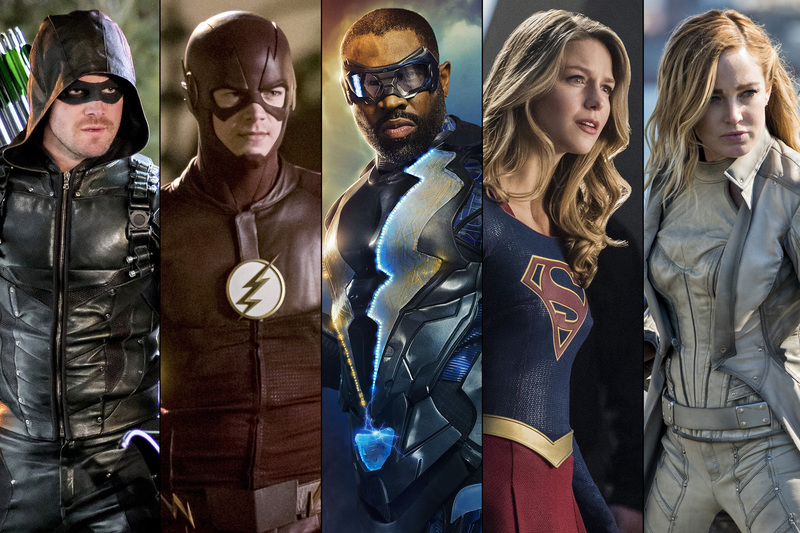 Below I look at each of the network’s superhero shows from least to most likely to conclude in 2019, updated based on the renewal of all the Arrow-verse shows plus Black Lightning for the 2019-20 season. The Flash: This show and its titular hero will survive the Crisis on Infinite Earths (even though–Spoiler Alert–Barry Allen died in the original comic book series). This is still the network’s highest rated show and has become the flagship of the network’s superhero entries. So consider it safe. Supergirl: This show’s numbers are down year-over-year (though that is partly due to its move to highly competitive Sundays), and it will have enough episodes for a syndication run (where shows really start to turn a profit) at the end of this season. And, not to be too much of a spoiler here, but Kara Zor-El did not survive the original comic book series. But I still think this show will stick around because the network will want to keep at least one female led show among its superhero entries. A Batwoman series could be joining the schedule as well (see below), but I still believe that Supergirl is safe. Black Lightning: I wasn’t too sure about this series previously because its numbers have not been great across its first two seasons, and I considered it possible that the network might cut if loose at the end of this year. But it got the third season renewal which means that it will almost certainly return for a fourth season because once a show has made it past its second season on The CW it usually sticks around through at least the 70 episode mark (which it will reach in its fourth year) despite the ratings. And if this one is sticking around, the Crisis crossover is the perfect time to merge it in with the Arrow-verse where it can benefit from additional crossovers with the other shows that could boost its viewership. Legends of Tomorrow: I previously considered this one of The CW’s safe Arrow-verse entries because it can be used to pick up characters from other shows that have ended. But it is currently the lowest rated of their superhero shows and it has to be one of the most expensive to produce. Next season will get its episode count close enough for a syndication run, and Black Lightning will be sticking around, so now I’m thinking LoT might be a more likely candidate to end during the crossover event. But as the network’s only team-up show, I wouldn’t count it out just yet. Arrow: This show is growing long in the tooth and I was actually thinking it might wrap up after its current season. But it will be back for an eighth season, and the Elseworlds crossover planted the seeds for this one coming to a close with the Crisis event. So I am thinking that next year will be the final season for Arrow and it could conclude during the crossover as some have already theorized. New Development: The CW has ordered a pilot for a Batwoman series and will be considering the show for its Fall 2019 schedule. The network boss has claimed that he does not believe they have reached the “saturation point” of Arrow-verse shows, so consider this one a strong candidate to join the line-up. I previously thought that this might replace Black Lightning or Supergirl, but now I’m thinking Legends of Tomorrow and/or Arrow are the more likely shows to end after the crossover event. As I have previously predicted, a shakeup to The CW’s superhero shows seems certainly to be on the way, and the upcoming Crisis on Infinite Earths event sure has the look of Project: Purge the Arrow-verse. It’s also possible that the network will break with tradition and not make final season announcements for shows they plan to end in order not to spoil the crossover event. So prepare for some big changes coming, but also rest assured that death is not necessarily a permanent condition in the comics nor in the Arrow-verse, so fallen heroes could return any time. They better not cancel Black Lightning. Best superhero series on television right now. Stephen Amell confirmed Arrow ending like 2 weeks ago. Yep. And this post was written at the beginning of February, but we will be revisiting the status of all the Arrow-verse shows in an upcoming post.